On November 22nd Mr. Gregory Howell was awarded the Foreign Minister's Commendation at the Japan Exchange and Teaching (JET) Program 20th Anniversary Commemorative Ceremony in Tokyo, Japan. After serving in Japan as a Coordinator for International Relations (CIR) for the city of Yokohama, Mr. Howell returned to the United States and became active in helping to establish the JET Alumni Association of Northern California (JETAANC). Thanks to his efforts, in 1994 the JET Alumni Association of Northern California was officially incorporated as a non-profit organization. 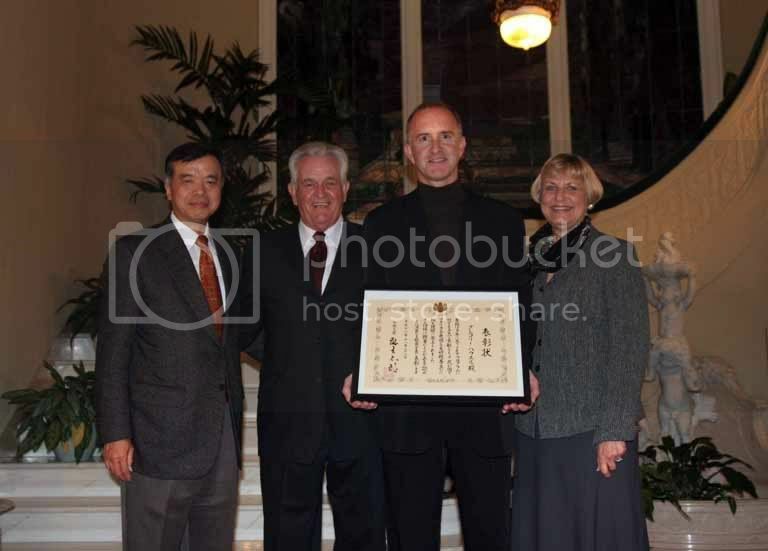 In 2002 he played a central role in establishing the JETAANC Scholarship for high school seniors who are pursuing enrollment in an accredited college or university and have an interest in Japan. This scholarship has encouraged local high school students to continue their studies in Japanese language and culture. Mr. Howell' s outstanding contribution through his work with JETAANC has served to advance international exchange and friendship between Japan and the U.S. at the local grass roots level and it is for this reason that he is being honored with the Foreign Minister's Commendation. On November 29th in celebration of Mr. Howell's commendation, Consul General Yamanaka and his wife hosted a reception for JET Program-related guests and former JET participants. At the reception, Mr. Howell spoke about his long interest with Japan beginning at a very young age. Following college graduation, he lived in Japan for five years and this year marks his 20-year history with Japan. Speaking about the importance of establishing the JETAANC Scholarship, he expressed his belief that young people, such as high school students, should recognize the significant role they can play in Japan and U.S. relations by becoming cultural ambassadors and a bridge between the two nations. He also shared stories from his recent one week stay in Japan which was arranged for all eight Foreign Minister’s Commendation honorees. The itinerary for the week included visiting public schools to observe the current education system and also meeting current CIR participants to discuss the future role of CIRs. The honorees were also given a private audience with Crown Prince Naruhito. After Mr. Howell's speech, he answered questions from the guests and vowed to continue to promote and enhance the relationship between Japan and the United States.